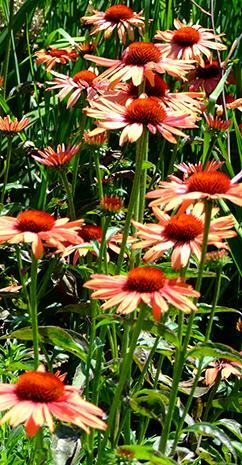 What are UC Master Gardeners? UC Master Gardeners are trained volunteers for the University of California Cooperative Extension (UCCE). They are residents of a local community who have an active interest in horticulture, have taken the Master Gardener training offered by the UCCE, and now share their knowledge with other members of that community. They provide University of California research-based horticultural information to the citizens of California through their volunteer efforts as UC Master Gardeners. It is the acquisition of knowledge, the skill in gardening, and giving back to the community that distinguishes a UC Master Gardener from other gardeners. How are UC Master Gardeners connected to the University of California? UC Master Gardeners are part of the University of California Cooperative Extension, an outreach and public service unit of the University of California (UC), Division of Agriculture and Natural Resources (ANR). The Cooperative Extension is a key component of the largest educational delivery system in the world, the Land Grant University system. All universities engage in research and teaching, but land grant universities, like the University of California, have a third critical mission, i.e. extension of research-based information to citizens in their local communities. Congress created the Extension system in 1914, and over the last century it has adapted to changing times and landscapes while continuing to address a wide range of human, plant, and animal needs in both urban and rural areas. Promote environmentally responsible and sustainable horticultural practices. Reduce fertilizer and pesticide pollutants. Protect water quality and quantity. Detect and manage invasive species. Protect wildlands and urban areas from destructive fires. These goals are attained through talks and demonstrations, plant clinics, staffing phone help lines, training at community gardens, supporting school gardens, staffing information tables at Farmers' Markets, fairs and nurseries, writing newspaper articles, distributing UC published information, and much more. Washington State held the first Master Gardener training program in 1972. It was developed because Washington State University Cooperative Extension agents were being overwhelmed with incoming calls from home gardeners. They established a group of trained volunteers to assist the public, and called them Master Gardeners. The program has now spread to 45 states and 4 Canadian provinces. California’s program began in 1980 in Sacramento and Riverside counties. Contra Costa County's program began in 1983. Currently 43 counties in California have Master Gardener programs. The first class to train UC Master Gardeners in Contra Costa County was held in Pleasant Hill in 1983. The early classes were taught by UC Agriculture Department professionals and were quite academic. Over the years, the focus has shifted to educating home, community, and school gardeners on sustainable, environmentally friendly gardening practices. Each year, more than 200 UC Master Gardener volunteers branch out into all sections of the county answering questions at Farmers' Markets or on the group’s popular Help Desk hotline. They advise schools on how to build and maintain school gardens that teach children about where food comes from and how to eat nutritiously. They provide gardening education at Community gardens and the popular Our Garden demonstration garden in conjunction with the Contra Costa Times, as well as presenting educational talks on sustainable landscaping at libraries and other public venues throughout the County. Altogether, 12,000 hours of volunteer service was provided to Contra Costa County’s population in 2009-10 by UC Master Gardeners here in Contra Costa. How can I obtain information from a UC Master Gardener? You can contact the UC Master Gardener Program of Contra Costa County by visiting the ASK US! page of this web site, by calling (925) 608-6683 or by emailing us at ccmg@ucanr.edu. Our Help Desk is open for calls, emails and walk-in assistance from Monday – Thursday, 9 a.m. – 12 p.m. In addition, FIND US! at ongoing events throughout Contra Costa County. How can I become a UC Master Gardener? Please visit our Join Us page for information on becoming a UC Master Gardener in Contra Costa County.